Valentine’s Day is our annual appointment with Cupid. A kiss between to people in love is the image par excellence of two lovers. A kiss is eternal, even if it lasts just a moment. What Gustav Klimt does in his renowned painting ‘The Kiss’ is forever immortalise the intense sensation that a woman experiences when she is enveloped in the embrace of someone she loves. Yet, there’s no need to wait for Valentine’s Day to love and love ourselves that little bit more. Any occasion can be just right for an appointment with love, whether we are talking about a boyfriend, husband or simply ourselves. Let yourselves be inspired by Klimt’s work of art and create your very own look… prepare to fall in love! Color is the instrument used by the artist to eternalise this moment of great passion and abandonment experienced by the two lovers, whose bodies merge through the blocks of color, formed by their mosaic-like clothing, and emit light thanks to gold appliqué detailing. Attention to detail, lively polychrome, the power of light. 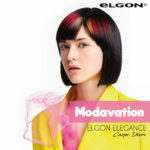 These are the elements that our Elgon Colorists and Klimt’s artwork have in common. Two Elgon products have in fact been inspired by Klimt’s ‘Kiss’ and would, according to our stylists, go down a real treat this Valentine’s Day: I|Care and Affixx 0 Shine It! I|Care is a direct cream colorant, ideal for home use, for those who don’t need to cover grey hair and want a temporary color that washes out relatively quickly. Natalia, our model (see photo), used it to create a play of bold and sensual nuances that illuminate her eyes. To complete and set the style, Affixx 0 Shine It! allows for impeccable, high-shine hold in just one spritz. This way, you hair will glisten just like the light in your eyes before your lover’s gaze. Find out more about Affixx 0 Shine It!